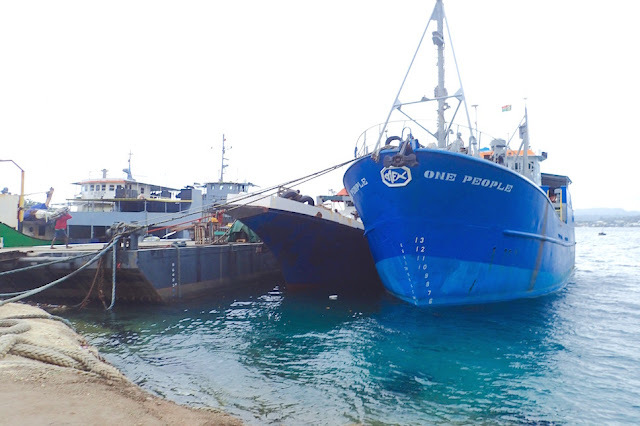 Galley Wench Tales: Oz: Glub Glub! Deep River Crossing lived up to its name! This is us crossing it to reach El Questro Gorge, on the first day this year it opened. Dicey! No way were we opening the window to get a shot. This was taken from inside, through our windshield. El Questro Wilderness Park, Kimberleys, Western Australia. Who-hoo! We were the very first non-rangers to hike the Kimberley's excellent El Questro Gorge this year!!! Purnululu, better known for the BungleBungles, was closed due to overly high water crossings from a particularly wet rainy season when we wanted to enter the park. We pushed on to El Questro. Western Australia, The Kimberleys. One day earlier, and Deep River Crossing access to El Questro Gorge was too deep; three days ago was the first day El Questro opened to the public. After being unable to visit Purnululu (aka the BungleBungles), Windjana, and much of Gibb River Road, it was nice to be in the right place at the right time* -- before the crowds! *In Broome, there were a number of activities that didn't open until May 1st. 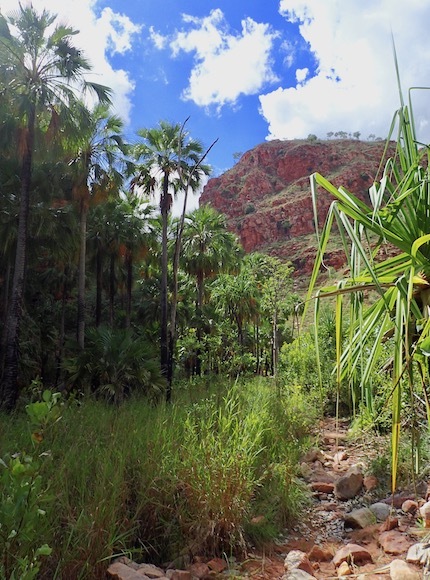 Pandanus, palms and vivid red gorge rock walls make for an unusual ecosystem so far inland. El Questro Gorge entrance. Kimberleys, Western Australia. With temperatures hitting near 100 degrees F by mid-morning, we were on the road by 6:40 am, coffee already downed, trail pack loaded up with water, breakfast and swimsuits. 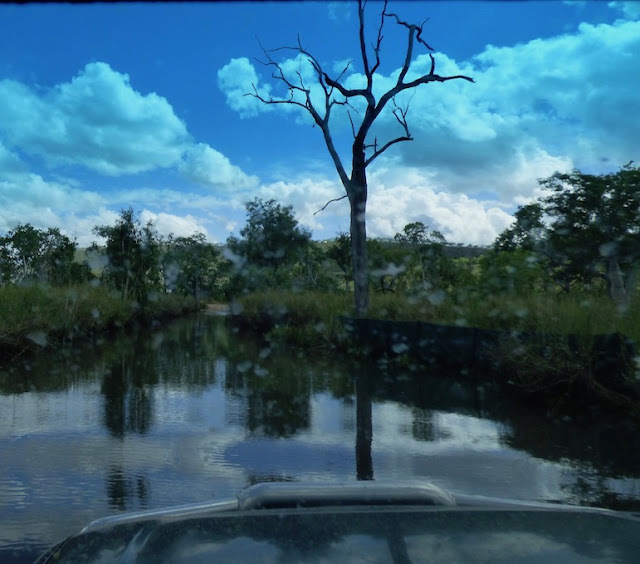 Once again, our Land Cruiser (and Wayne's driving) rocked! Deep Creek Crossing water level came up above our Cruiser's running boards! We are highly impressed with the door seals! Nary a drop inside. 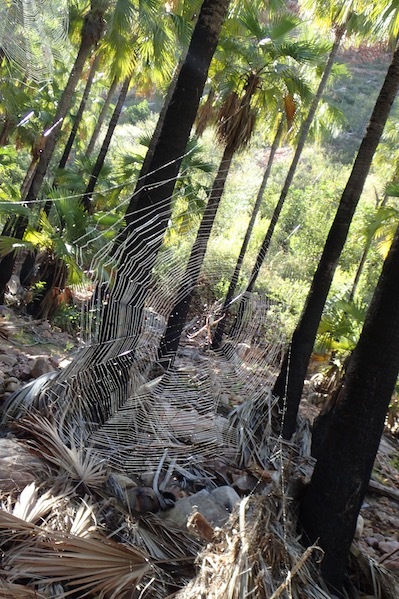 webs intrigued us. We were happy to side-step them. El Questro Gorge, Western Australia. Shortly after passing that gauntlet, we hit the trail at 7:15 am. We were the first vehicle at the trailhead, in a place where hikers 4-wheel drive, drive, not walk to the trailheads. a light sandy coating. El Questro Gorge. Western Australia. 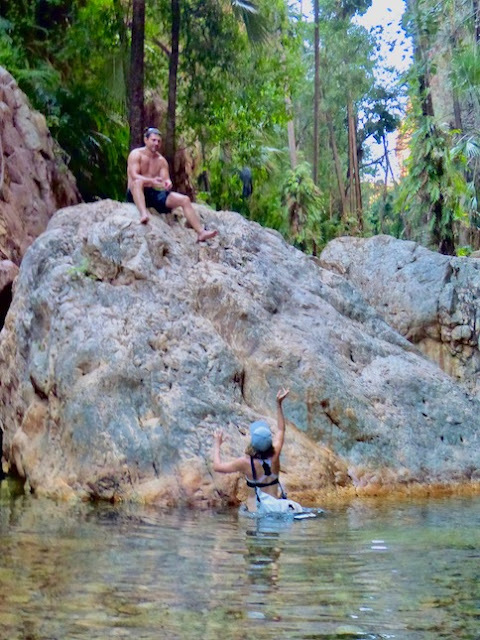 El Questro's "halfway pool" is about a 2-hour roundtrip hike. 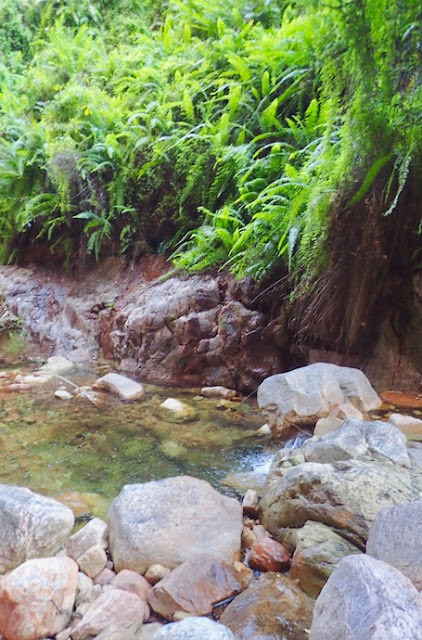 That's a Class 4 - challenging - hike, and it's a Class 5 - most challenging hike -- to the trail's end and a second pool. We opted for "halfway pool." We knew by the time returned to our vehicle, despite our refreshing dip at halfway pool, we'd be totally sweaty all over again. 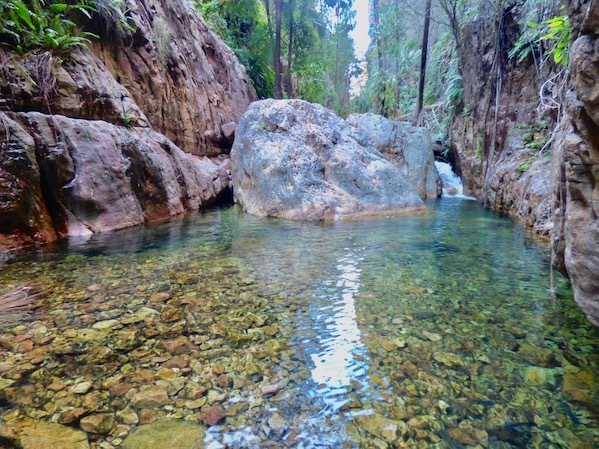 Lovely Halfway Pool in El Questro Gorge, complete with a small waterfall. This is where we stopped, swam and made our way back from. completed the full hike, They confirmed it was a tough one. When we finished our El Questro Gorge hike, and before glugged our way through Deep Creek Crossing again, Wayne said, wistfully, "Maybe you could get a picture of the Cruiser crossing Deep Creek Crossing." Much as I too would've loved to see it, as the one who would have to wade across with my camera, "Nope," I replied, emphatically. "I was only half-kidding," Wayne said. I knew he was also half serious. 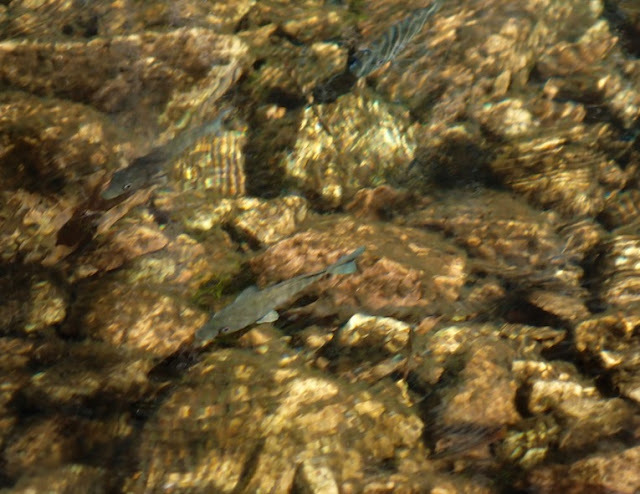 Fish in Halfway Pool, El Questro Gorge, Kimberleys, Western Australia. It wasn't until afterward I discovered Wayne didn't intend my photography to require a swim; he would've made a third crossing, to come back and pick me up. Ah well. There's a limit to how many times one should tempt fate, and test our Cruiser's door seals. Ferny pool along El Questro Gorge trail to Halfway Pool. We were in El Questro, from April 16-19, 2017; it's in the Kimberley region of Western Australia. 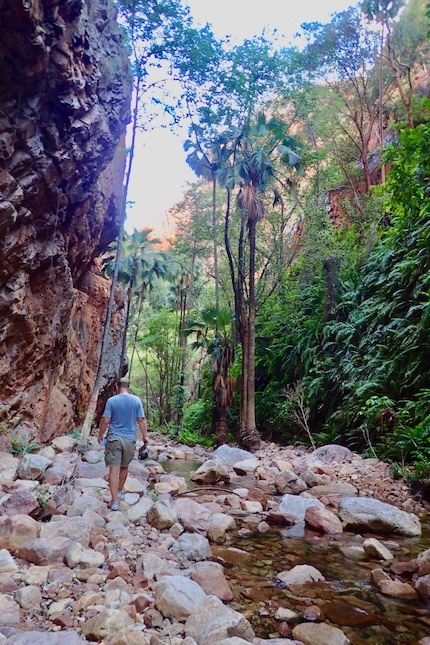 We hiked El Questro Gorge April 18th, and are currently in Katherine, in Australia's Northern Territory. 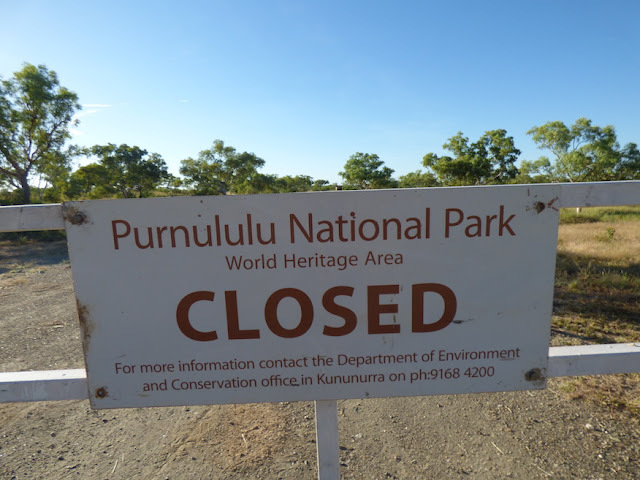 Entering Australia's Northern Territory, from Western Australia. More on El Questro in future posts! El Questro was our favorite stop in Australia -- the perfect end to our Australian outback adventures. The next week or less we'll drive to Brisbane (over 3,000 km from here). 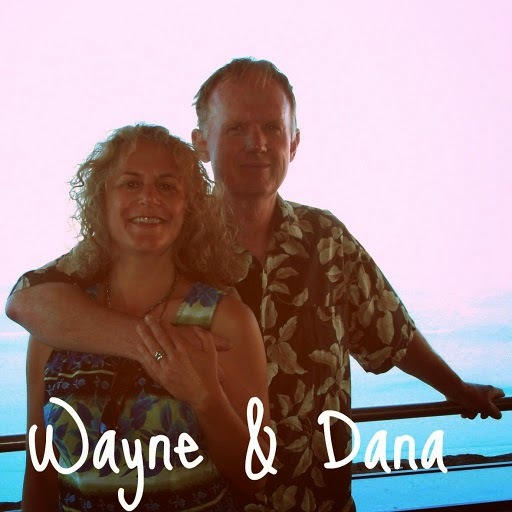 Once in Brisbane, we plan to spend a week there, to connect with friends, sell our Land Cruiser, wrap up our loose ends in Australia, enjoy Brisbane, and then fly back to the US. There will continue to be blog catch-up posts as well as substantial blog rework to make it easier and more informative for anyone wanting to follow in our footsteps.